Image from Around Lot 34 in Movie Makers, Dec. 1951, 393. "In the process of viewing Around Lot 34, one is reminded of the gag in old comedies where an impossible number of persons emerge from an automobile. Only in this case it is the incredible amount and variety of produce and flowers grown in the area of a trailer plot. Henry J. Auger has made a "dawn to dusk" film of trailer life, but he has lifted it above a humdrum record by occasional inserts of humor that are wisely not belabored. 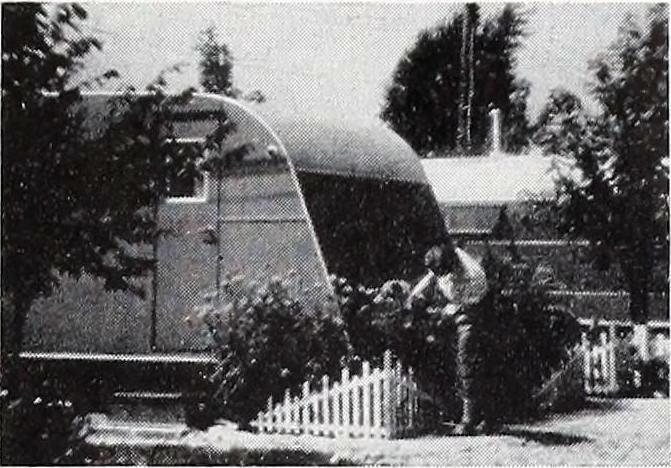 Mr. Auger makes life in a trailer park seem relaxed and pleasant indeed — with Mother doing all the chores. The result is a film of warmth, refreshingly portrayed." Movie Makers, Dec. 1951, 411. Screened at Toledo Amateur Movie Makers meeting at the Toledo Museum of Art 1953. Movie Makers, Aug. 1953, 220. , Toledo, OH. Screened at Metropolitan Motion Picture Club's annual Gala Night held at the Hunter College in New York City 1 March 1952. Movie Makers, Mar. 1952, 90. , New York City, NY.